What's the Most Shorted Dow Stock? Just because a Dow stock happens to have lost of lot of value lately doesn't mean it's immune to even more bearish bets. Short-sellers tend to cash in their chips when their target stocks plunge downward. Why risk large losses when you have a solid profit on the table, right in front of you? But the most heavily shorted stocks on the Dow Jones Industrial Average (DJINDICES:^DJI) today also happen to be some of its worst recent performers. What gives? The single most shorted Dow stock right now is aluminum producer Alcoa (NYSE:AA), according to the latest short-sales report. 8.9% of its shares have been borrowed and shorted, a 7.5% increase in two weeks. The second and third names on this unfortunate list are Caterpillar (NYSE:CAT) and Intel (NASDAQ:INTC), with just over and under 4.7% of their float sold short, respectively. 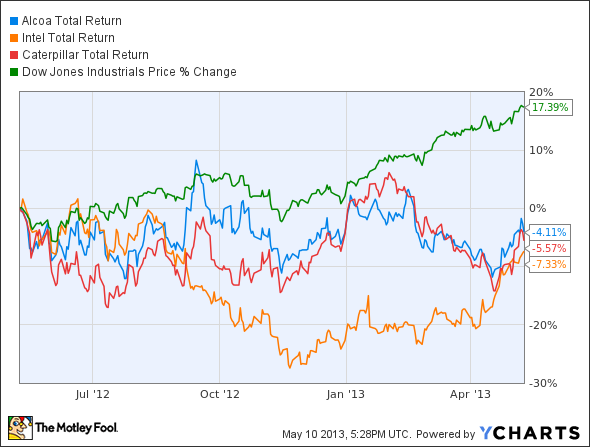 That's three of the four worst Dow performers in 12 months. Only Hewlett-Packard (NYSE:HPQ) and its never-ending turnaround attempts squeezes in among them with a 6.5% 52-week drop. And you know what? That's the fourth-most shorted Dow stock anyhow. So the market is consistently betting against the renowned "dogs of the Dow." Intel and HP are suffering from death-of-the-PC-itis. Both companies play a heavy hand in that fading market. But Intel also runs the table in back-end server systems, not to mention that it hasn't given up on mobile computing quite yet. HP is nonexistent in the tablet, smartphone, and mobile gadgetry scene, and also carries a heavy load of management failures on its shoulders. If anything, I would argue that HP and Intel should switch places on the short-sales list -- and then some. In fact, I like Intel's chances so much that I own the stock nowadays. Caterpillar and Alcoa have become proxies for the global economy. Their share prices swing wildly with every bit of news that might affect infrastructure projects worldwide, whether it's in America, China, or even Cyprus. A bet against these construction-centric companies is a bet on continued economic weakness. There seems to be plenty of negative sentiment to go around, even as the 2008 crash fades in our rearview mirrors. So this pairing of high short interest and low stock performance actually seems to be based on the prospects of each individual stock -- not a reverse "dogs of the Dow" strategy. The bets may be misplaced in at least one instance, but somebody out there really believes that these underperforming Dow stocks have a bit further to fall.